I wouldn't even give cauliflower a second glance until about 1996 when I was travelling in Portugal and stopped in at this lovely little restaurant in Lisbon that my guide book raved about. I wish I could remember the name, but it escapes me. My meal came with a side of pickled carrots and cauliflower. At first I pushed them both to the side of my plate and chose to ignore them, but then the waiter mentioned to me that their 'bite' would compliment the other food on my plate. Not one to let down my good looking Portuguese waiter I acquiesced and decided to give them a try. He was right! The carrots were sweet and spicy at the same time and the cauliflower was spicy, tart and crisp. 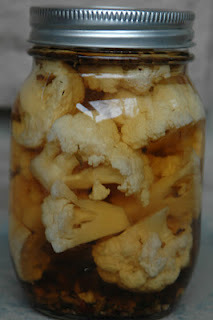 Since then, I have searched for the perfect pickled cauliflower. Several of the family recipes I tried the cauliflower ended up too soft at the end of the pickling process and none of them had the spice I was looking for. I bought it in stores and at farmer's markets and all of it just didn't stand up to the pickles of Lisbon. I began to think that perhaps the pickles had never really even tasted that great and that it was the fresh Lisbon air, the handsome waiter and the freedom of travel that had made my taste buds so hard to please now. But then I stumbled across this recipe online and with one or two changes my taste buds began to dance happily around in my mouth :). They had the perfect crunch, the right bite and just enough spice to transport me back to that little restaurant in Lisbon. - I let them sit for at least 3 weeks before trying to let as much of the spice and flavour absorb into the cauliflower.